michael.addlesee @ ttpcom.com - please send work related mail to this address. m0blp @ amsat.org - this is my home email address. m0blp @ m0blp.ampr.org - if you're a radio amateur, try this email address. Michael D. Addlesee (C.Eng. MIEE MIEEE) received the B.Sc. (Hons) degree in Physics from the University of Nottingham in 1981, the M.Sc. degree in Communications Engineering from Imperial College London in 1986 and the Ph.D. degree in Electrical Engineering from the University of Cambridge in 1991. In 1985 whilst working for Marconi Communication Systems, he was awarded a GEC Fellowship for a years study at the University of London. His Ph.D. research on Image Compression using the Subband Technique was, in part, funded by Thorn-EMI Central Research Laboratories, the IEE and the Fellowship of Engineering. His research interests are in digital signal processing, image compression, genetic algorithms, portable multimedia computer networks and sentient computing. From 1991 to 2002 Dr Addlesee was a Research Engineer with AT&T Laboratories Cambridge (formerly the Olivetti Research Lab). In May 2002 he joined TTPCom where he is working on intellectual property for mobile phone technologies. I am a keen radio amateur and I hold the callsign M0BLP. Currently I operate on wavelengths of 2m, 70cm, 23cm and 3cm and can sometimes be found on the HF 40 and 80m bands. At AT&T Laboratories Cambridge I helped to run the club station G7ORL which hosted the TCP/IP packet station GB7ALC. Since the demise of AT&T Laboratories Cambridge GB7ALC has been relocated to the Lab for Communications Engineering Cambridge University Engineering Department. I am also chairman of the Cambridge & District Amateur Radio Club. I play a Stephen Hill guitar, made in 1992. 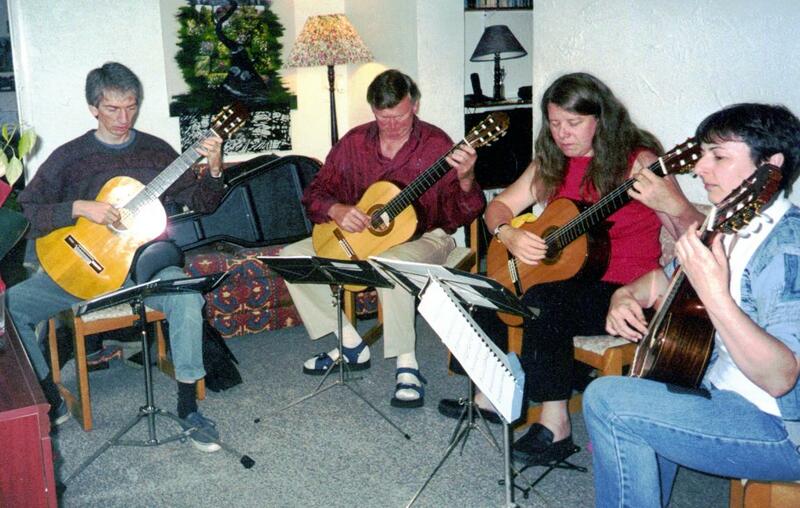 On rare occasions I've played in public as a member of the Eastfields Guitar Quartet. Click on one of the formats below for a 15 second clip of me playing the intro to Antonio Lauro's El Negrito. You can see the sheet music for this at http://www.geg.at/noten/negrito.pdf. At home I experiment with Debian Linux running on an AMD Athlon processor. Amongst other things, this system is used for experimenting with amateur packet radio using TCP/IP. I love skiing. My last trip was to Val Thorens, France earlier this year with that fine bunch of people from the St Albans Sub Aqua Club.